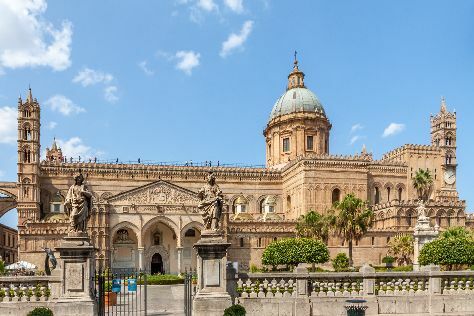 On the 5th (Mon), steep yourself in history at Catacombe dei Cappuccini, take in the architecture and atmosphere at Duomo di Monreale, then head outdoors with Essai Sport Lido, and finally pause for some serene contemplation at Cattedrale di Palermo. Keep things going the next day: don't miss a visit to Santa Maria dell'Ammiraglio, then contemplate in the serene atmosphere at Church of San Cataldo, then take in the architecture and atmosphere at Church of Jesus, and finally take in the architecture and atmosphere at Norman Palace and Palatine Chapel. To see reviews, more things to do, other places to visit, and more tourist information, you can read our Palermo trip maker website . Riyadh, Saudi Arabia to Palermo is an approximately 10.5-hour flight. You can also do a combination of flight and bus. The time zone changes from Arabia Standard Time (AST) to Central European Time (CET), which is usually a -2 hour difference. Finish your sightseeing early on the 6th (Tue) so you can travel to Naples. Naples is the capital of the Italian region Campania and the third-largest municipality in Italy after Rome and Milan. Start off your visit on the 7th (Wed): contemplate the long history of Pompeii Archaeological Park and then delve into the distant past at Ruins of Herculaneum. To see other places to visit, reviews, traveler tips, and other tourist information, refer to the Naples day trip planning website . You can fly from Palermo to Naples in 4 hours. Other options are to do a combination of bus and flight; or ride a ferry. In September, plan for daily highs up to 31°C, and evening lows to 20°C. Finish your sightseeing early on the 7th (Wed) so you can take a train to Rome. Start off your visit on the 8th (Thu): admire the striking features of Pantheon, then explore the ancient world of Colosseum, then wander the streets of Trastevere, and finally contemplate the long history of St. Peter's Basilica. Get ready for a full day of sightseeing on the next day: ponder the design of Trevi Fountain and then take advantage of the amenities at V Lounge Beach Club. To see traveler tips, where to stay, reviews, and tourist information, read our Rome trip app . Traveling by train from Naples to Rome takes 1.5 hours. Alternatively, you can drive; or take a bus. In September in Rome, expect temperatures between 32°C during the day and 18°C at night. 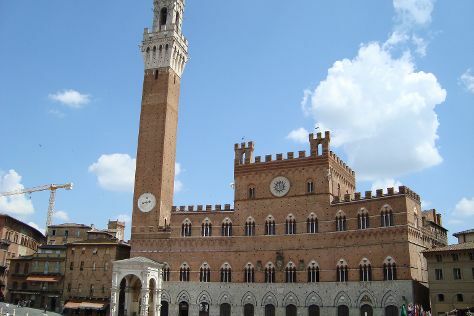 Wrap up your sightseeing on the 9th (Fri) to allow time to drive to Siena. Start off your visit on the 10th (Sat): pick up some new kitchen skills with Take Me Out in Tuscany, then pause for some serene contemplation at Siena Cathedral, then get a sense of history and politics at Palazzo Pubblico and Museo Civico, and finally contemplate in the serene atmosphere at Battistero di San Giovanni. For maps, where to stay, traveler tips, and tourist information, go to the Siena trip planning site . You can drive from Rome to Siena in 2.5 hours. Other options are to take a bus; or take a train. In September, plan for daily highs up to 32°C, and evening lows to 19°C. Wrap up your sightseeing on the 10th (Sat) early enough to drive to Florence. Kick off your visit on the 11th (Sun): see the interesting displays at Academy Of Florence Art Gallery, enjoy the sand and surf at Easy Living - Spiaggia sull'Arno, and then explore the world behind art at Uffizi Galleries. On the next day, get to know the fascinating history of Piazza della Signoria, get engrossed in the history at Basilica di Santa Croce, then take in the architecture and atmosphere at Cathedral of Santa Maria del Fiore, then don't miss a visit to Palazzo Vecchio, and finally take in panoramic vistas at Campanile di Giotto. For other places to visit, photos, reviews, and tourist information, use the Florence travel route planner. You can drive from Siena to Florence in an hour. Alternatively, you can take a bus; or take a train. In September, daily temperatures in Florence can reach 30°C, while at night they dip to 17°C. Finish up your sightseeing early on the 12th (Mon) so you can catch the train to Bologna. On the 13th (Tue), experience rural life at Azienda Agricola Moscattini, then ponder the world of politics at Castello Estense, then appreciate the extensive heritage of Le Mura, and finally pause for some serene contemplation at Basilica - Santuario di Santo Stefano. Here are some ideas for day two: make a trip to Torri degli Asinelli e Garisenda, then pause for some serene contemplation at Basilica di San Petronio, then soothe aching muscles at Massaggio Californiano, and finally steep yourself in history at Acetaia Villa San Donnino. For other places to visit, photos, where to stay, and more tourist information, you can read our Bologna road trip planning website . Getting from Florence to Bologna by train takes about an hour. Other options: drive; or take a bus. In September in Bologna, expect temperatures between 30°C during the day and 17°C at night. Wrap up your sightseeing on the 14th (Wed) to allow time to take a train to Verona. Kick off your visit on the 15th (Thu): contemplate the long history of Museo di Castelvecchio, take in the spiritual surroundings of Basilica di San Zeno Maggiore, snap pictures at Ponte Scaligero (Ponte di Castelvecchio), pause for some serene contemplation at Chiesa di Sant'Anastasia, then don't miss a visit to Piazza delle Erbe, and finally listen to music at Arena di Verona. To see traveler tips, maps, and more tourist information, use the Verona trip maker app . You can take a train from Bologna to Verona in an hour. Alternatively, you can drive; or take a bus. In September in Verona, expect temperatures between 30°C during the day and 17°C at night. Wrap up your sightseeing on the 15th (Thu) to allow time to drive to Venice. Kick off your visit on the 16th (Fri): take a stroll through Dorsoduro, then admire the landmark architecture of Doge's Palace, then take in the views from Ponte dei Sospiri, and finally explore the activities along Canal Grande. On the 17th (Sat), you'll have a packed day of sightseeing: pause for some serene contemplation at Scuola Grande di San Rocco, then admire the masterpieces at Peggy Guggenheim Collection, and then explore the world behind art at Gallerie dell'Accademia. To find reviews, maps, where to stay, and other tourist information, read our Venice journey website . Drive from Verona to Venice in 1.5 hours. Alternatively, you can take a bus; or take a shuttle. In September, daytime highs in Venice are 29°C, while nighttime lows are 17°C. Finish your sightseeing early on the 17th (Sat) so you can travel back home.